"In 1868 he painted The Black Knights which is now in a private collection. The scene depicts a fight between two boys, both chimney-sweeps. They are sitting on the backs of donkeys and using their brushes as weapons in the tradition of the Medieval tournament. The picture is full of gentle humour, not only in the activity of the contestants but also in the jostling crowd of onlooking schoolboys. The faces of these children are worthy of study, as is the careful painting of the street and houses in the distance. Bussey has beautifully captured the atmosphere of a snowy winter's day ... The detail of the fighting dogs in the foreground ... mimic the activities of their masters ... The Black Knights shows Bussey to have been possessed of considerable vitality as an artist, and it is this painting, rather than his historical subjects which brings his talents to the fore." 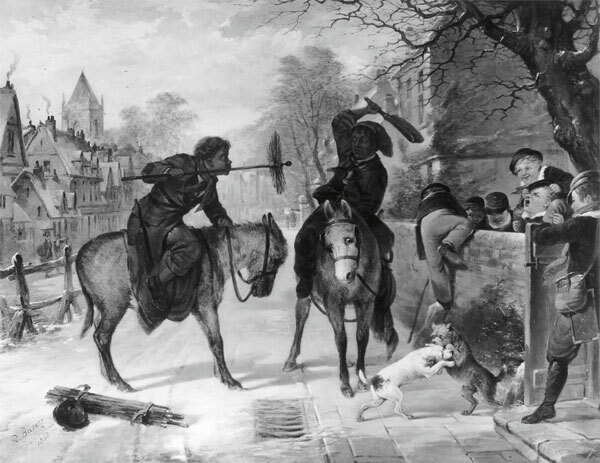 Today Bussey's portrayal of child chimney sweeps seems sentimental and a typically Victorian treatment of a practice that now we would regard as barbaric. The subject also appears in Kingsley's The Water Babies which was published 6 years earlier and was one of Queen Victoria's favourite books.